My maternal grandmother Edna Hazel Palin was born on the 14 April 1910 in the mining town of Broken Hill. At the turn of the twentieth century Broken Hill had a population of around 27,500 people and was one of the largest commercial centres in New South Wales. A thriving mining town, Broken Hill, "achieving notoriety for two reasons - strikes and dust storms". In a typical dust storm, the town would be enveloped in dense clouds of choking red sand which penetrated almost every building. Machines became clogged, canvas blinds shredded and outhouses knocked flat. In one severe storm it was reported that ‘some lanes were blocked by outhouses which had blown across the roadway’. 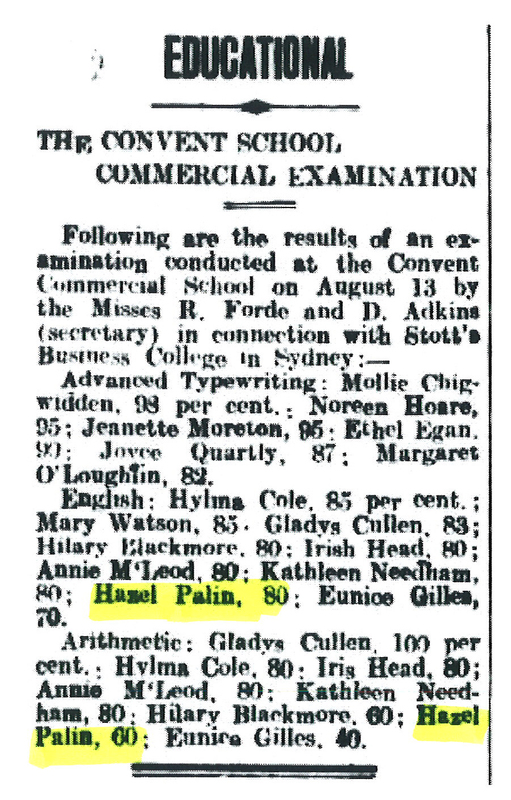 My grandmother's parents were Charles Henry Palin (1851-1957) and Eliza Golding (1872-1951). 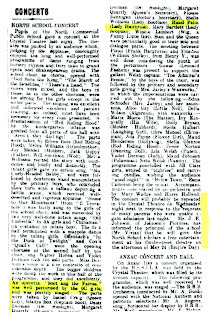 Hazel's parents and their young daughter Thelma moved from Port Pirie, South Australia sometime between 1905 and 1907. 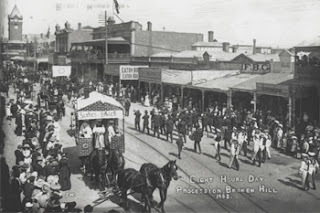 It is quite possible their decision to come to Broken Hill was to provide for support the wife and children of Thomas Palin (Charles's elder brother) who was killed in an accident when he was caught between two rail trucks in 1905. Charles was a carpenter by trade, he was also a strong supporter of the unions and a member of the Independent Order of Odd Fellows, (masonic fellowship). Life for the miners in Broken Hill was difficult and they worked long hours. 1909, the year before Hazel was born, saw the unions set up picket lines in their quest for better working conditions. This was a violent time in Broken Hill with clashes between the companies and miners. However after several months of striking the miners went back to work on the same pay rate and hours (48 hours a week). After the family moved to Broken Hill Hazel's (as she was known) elder brother Alfred was born in 1907, and followed by Hazel in 1910. Thelma, Alfred and Hazel went to school North Commercial Public School. Hazel and her brother, Alfred, (or Alf) enjoyed music, Hazel studying piano and Alf the violin at the Convent of Mercy. In later years, Alf went on to play violin with the Adelaide Symphony Orchestra. 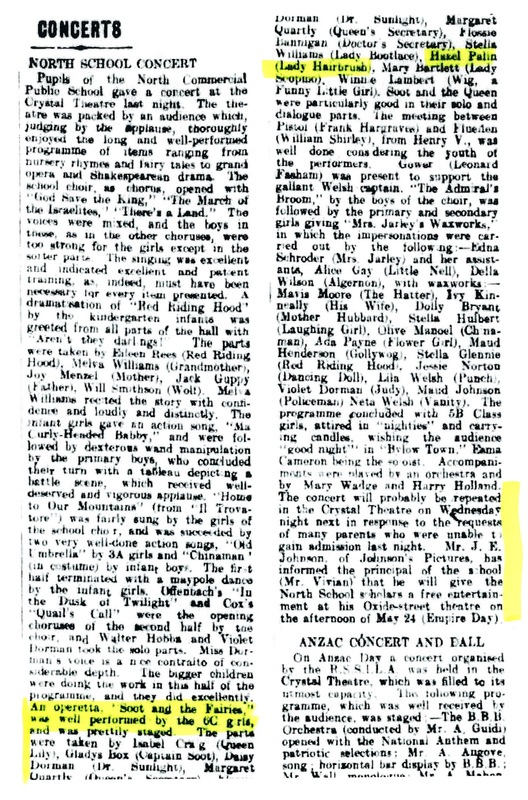 An article in the Barrier Miner, Thursday 28 April 1921 describes Hazel Palin as part of a group of 6C girls who performed admirably the operetta "Soot and the Fairies". Hazel had the part of "Lady Hairbrush". (One has to wonder, what this part involved). 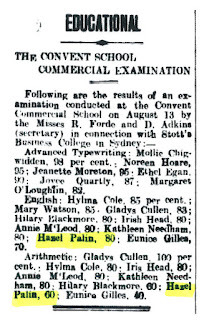 When Hazel finished primary school, she continued with her music lessons and studied shorthand, typing and english at the Convent Commercial School. At the age of 17 she completed her education at the commercial school and used her skills in typing and shorthand to take up the position as a clerk in one of the local businesses. 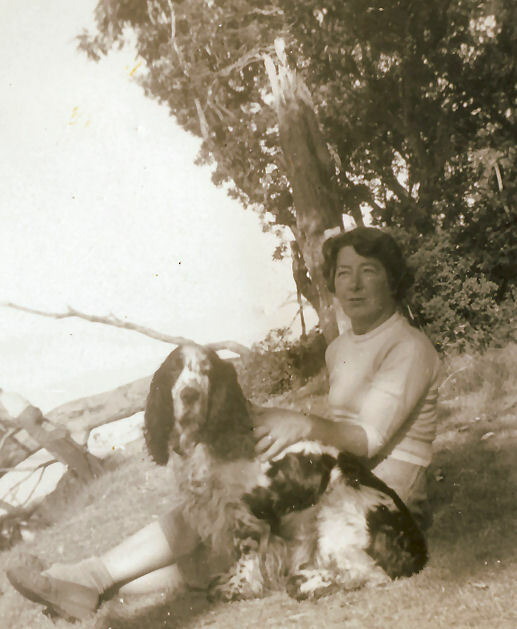 Hazel's daughter Maureen remembers her mother as being "a very good pianist who could play classical pieces very well. She often played for friends and family gatherings and many singsongs when the family gathered around the piano lounge room." The 1930 NSW census shows that Hazel and her parents were living at 137 Brazil Street, Broken Hill. Three years later Hazel, who was described as a petite young lady, who was just over 5 foot tall with dark wavy hair, met and married Roy Clarence Herbert. Roy was a young laborer who had moved to Broken Hill from the copper mining town of Burra, SA and they were married at the Methodist Manse on 24 July 1929. The young couple started married life living with Hazel's parents, Charles and Eliza in Brazil Street (1930 NSW Census).